The OLP-88 TruePON tester is the first instrument in the market with test capabilities like OLT and ONU identification, ONT activation process verification, automatic PON power levels certification, in-service insertion loss test and Alien/Rogue ONUs detection. 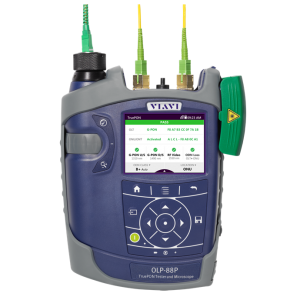 Together with accurate downstream and upstream power level measurements the OLP-88 ensures more reliable PON tests and faster trouble shooting of network issues. The built-in G-PON data analysis simplifies and speeds up installation workflows by automatically providing all necessary information about the system to the service technician.